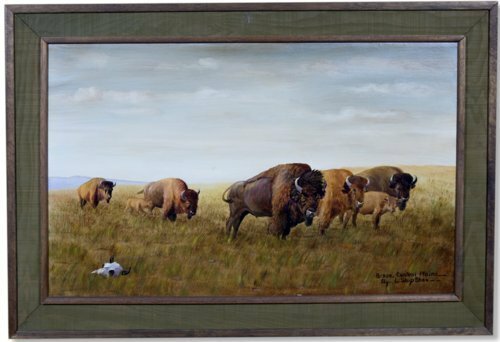 Oil painting of bison by Louis ShipShee, a Potawatomi Indian chief and artist. ShipShee was born August 11, 1896, on the Potawatomi Reservation near Mayetta, Jackson County, Kansas. He was a self-taught artist, know throughout the United States and Europe. He was an instructor at Haskell Indian College from 1932 to 1938, and lived in Topeka from 1952 until his death on June 17, 1975. Provenance of the painting suggests that it was given to Alf Landon by the artist.